WRAPUP: After an early morning meetup with about 40 cars, we took off in groups of six to head out on some northerly fun roads. There were a couple of icy suprises along the way to get our heart rates up, but it was mostly a casual ride. We took over the parking lot at the Jelly Belly factory, and were joined by an additional 20 cars from the Milwaukee club. After a factory tour, some hanging out and a group photo, we headed out on the second leg of the trip. A twisty low speed drive along the lakeshore allowed us to take in the sights and show off to the local residents. We had a lunch in downtown Kenosha, with raffles prizes from Knauz MINI and Mike & Linda from Fabric Fusion (in Brown Deer Wi). Overall a great drive, great weather, and great MINI friends. A perfect way to start off the driving season!! Huge thanks to Dustin for all the planning and organizing. If anyone has links to event photos, send the link to me and I will add them here. WRAPUP: MINIUSA and Patrick MINI were on hand for the private screening of the first 3 episodes of Hammer & Coop as well as a chance to get up close and personal with a new 2007 MINI Cooper S done up in the lightning bolt graphics. We were treated to popcorn and drinks, as well as a screening of Breach. It is really impressive to have a car company go out of their way to keep their customers involved and interested. Huge thanks!!! The cold and dreary February days are a perfect time to start planning your MINI vacations. 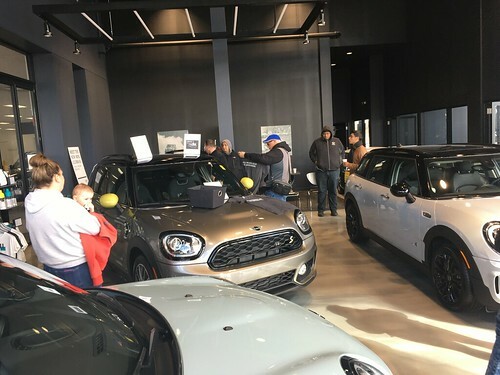 Here are some large events that Chicago members will be attending.. Post up, and hopefully hook up for a few great road trips with your Chicago area MINI friends. The Badger Bimmers have extended an invitation to our club to attend their Drivers School held at Blackhawk Farms racetrack on May 25th. There are a few requirements..